Family Fun day event provided 300 Ceylinco Life policyholders an opportunity to have fun as a family during this holiday season. The event was held at Saniro Dream Paradise in Veyangoda on 11th August 2018. Fun day event was part of the ‘Children First, Education Next' campaign which was launched during 2018 February to bring attention to the fact that children will be confident, independent and creative if they are given ample love and care and enough freedom to learn. 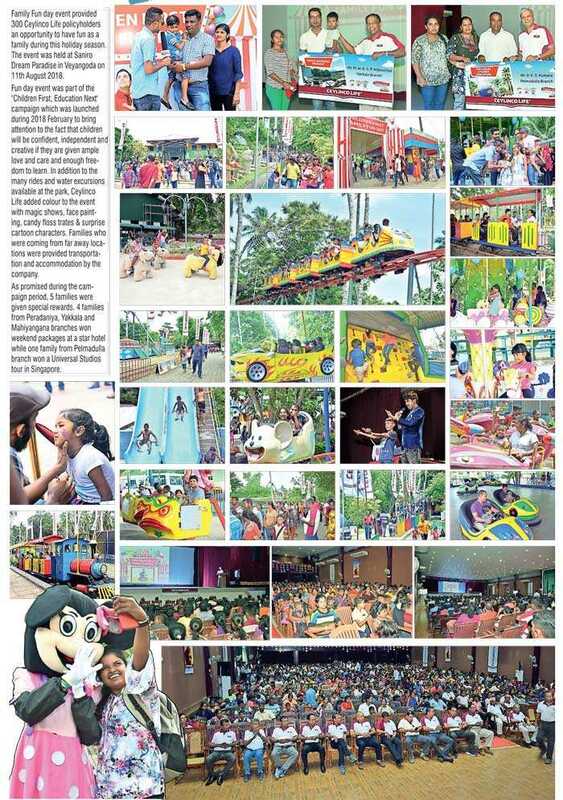 In addition to the many rides and water excursions available at the park, Ceylinco Life added colour to the event with magic shows, face painting, candy floss trates & surprise cartoon characters. Families who were coming from far away locations were provided transportation and accommodation by the company. As promised during the campaign period, 5 families were given special rewards. 4 families from Peradaniya, Yakkala and Mahiyangana branches won weekend packages at a star hotel while one family from Pelmadulla branch won a Universal Studios tour in Singapore.